Bagworms, found throughout the Eastern United States, are a major pest for evergreens. These insects are known for the cone-shaped bag they create around themselves, hence their name. These insects damage trees by feeding on their foliage. Most trees will see partial defoliation; however, some heavily infested trees will experience complete defoliation. The greater the amount of defoliation the greater amount of stress is put on the tree which can lead to other health issues like insects and fungi that prey on weakened trees. 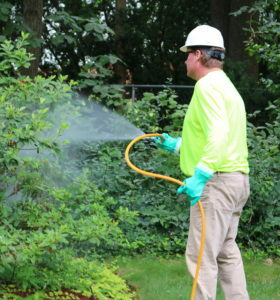 Arborvitae and Red Cedar are the tree’s most favorite host but Cypress, Juniper, Pine Spruce, Apple, Birch, Black Locust, Elm, Maple, Poplar, Oak, Sycamore, Willow and over 100 other species are also attacked by the pest. 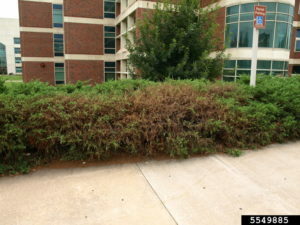 Infestations of evergreens typically cause long-term damage and can be deadly to the tree if not treated. Deciduous trees on the other had typically fare better than their evergreen counterparts when infested. 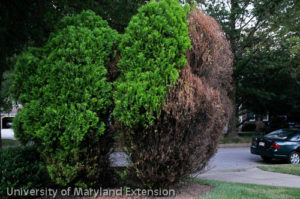 Deciduous trees won’t sustain as long-term damage and can typically bounce back after infestation; however, while in a weakened state other more harmful insects & diseases (secondary invaders) may attack the tree. 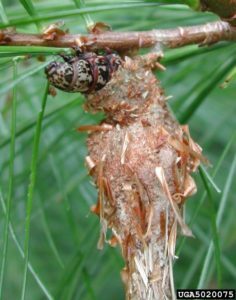 Bagworms are most noticeable in late summer when you can see their completed cocoon hanging from the branches of trees. Commonly mistaken for swaying in the wind, these bagworms move in their cocoons which causes them to sway back and forth throughout the day. Although late summer is the time they are most noticeable they a best treated for in late spring after they hatch. On small shrubs and trees, you can handpick or cut the bags from the infested plant during late fall or winter before egg hatch. Don’t just pick them and throw them on the ground though. These bags must be disposed of away from your property or you will risk re-infestation in the spring. When bagworms are too numerous to handpick or are too high in the tree to do so safely, insecticides should be used. These insecticides should be used during the bagworms larvae stage. Once they are fully in their bags/cocoons in late summer/fall insecticides will not be effective. 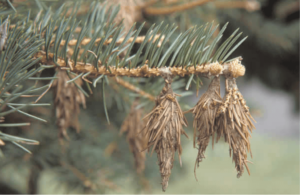 If you are seeing signs of bagworms in your trees this year or if you remember seeing cone shaped bags last year, your trees would benefit from bagworm treatments. Previous Carpenter Ants in Trees – Are They Harmful?